Amir Khan fights are always unpredictable and entertaining, which is something that can't be said of many fighters in the modern age. He packs a powerful punch and leaves it all in the ring. His wins are not always the most straight forward affairs though and he's certainly not within his flaws as a fighter. Still, his reputation for not ducking fights was made abundantly clear as the announcement of his fight against Saul Alvarez raised many an eyebrow. The two meet on Saturday night in Las Vegas in what is likely to be a defining moment of Khan's career. His opponent, is also known for delivering a powerful punch, something that Khan has shown vulnerability against in his career. 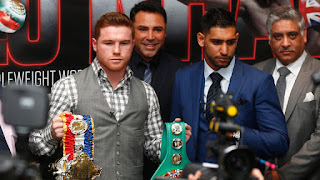 Alvarez has lost just one fight in the career, to undefeated Floyd Mayweather Jr. Even then he only lost on points. From the off then Khan is somewhat up against it and adding to that the fact that he's fighting a whole two weight divisions up in a bid to secure the WBC middleweight crown, it's left many wondering if he's bitten off more than he can chew. He's understandably been packing on the pounds and certainly looks the part thanks to trainer Virgil Hunte'rs tough workouts. Perhaps though there are questions over whether he can maintain his speed, which is typically one of the most important weapons in his arsenal, with the added weight. Current winner market odds have Amir Khan at 3-1 with most bookmakers and Saul Alvarez at 3/10. This assessment alone tells you to the extent that people feel Khan has a real task on his hands. The draw is between 25 and 33-1 depending on the bookmaker.